We are looking at property in the Houston area, so flood zones are always a concern when evaluating a property. Frequently, the property itself does not appear to be in the 100 yr. flood plain (Zone AE), but the street in front of the house is. I understand that the streets are lower and you'd expect the water to go there first, but what I want to know is whether the home itself would be considered to be in that zone for insurance purposes. I would call your insurance agent and have them run the property to tell you. I use the following web site. Just enter an address, and the site will tell you if the property is "high-risk". These are the actual FIRM maps that are used to evaluate areas. The demarcation lines are intentionally thick. It is a hassle to actually find your property, but well worth it. If the line touches ANY part of the house (deck, garage, anything), then you are in that zone - unless you can prove to FEMA that the lowest elevation of the house is above the level indicated for that zone on the map. 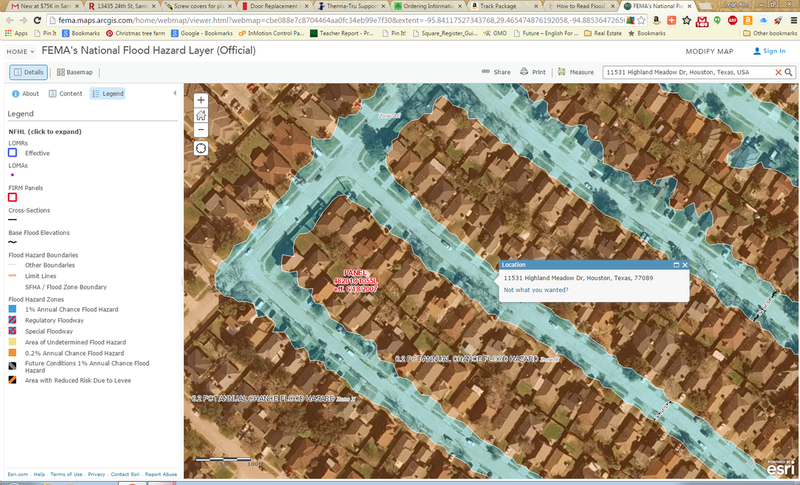 Floodprone Street Index: Shown on selected Flood Maps, this index lists the streets in the mapped community that are partially or completely in the special Flood Hazard Area. It also indicates the panel(s) on which each street is shown. Grid coordinates that allow you to locate the street on the panel are listed for each street. The Floodprone Street Index may be shown either on the index or on a separate panel. @Travis Lloyd , I think I should try to get the printed versions of those maps. You can't zoom in very far, and when you do zoom, you can't read the printing! Enter the address in the top right corner and you should be able to zoom down to the property level and see pretty clearly. When the next page loads, there will be a map on the right and buttons on the left. Make note of the approximate location of the house (red circle) on the map in relation to the boundaries, as this will help you find the house. Something like "lower left corner". Click the "View Map" button on the left side. This will open a new window called Intranetix Viewer. I use the "Zoom Win" button on the left and draw a large rectangle in the approximate area, zooming the map. Then I try to locate main streets to figure out where the house is, and keep zooming in until I find it. I have given up trying to decrypt the various flood maps. The link I provided earlier will tell you if the property is "high-risk" or not by just entering an address. I think flood insurance is required for high-risk properties. @Leigh Ann Smith if you are using a real estate agent who is a member of HAR, they can tell you whether a property is in a flood plain zone or not via the MLS. I entered the address of a property in floodsmart.gov that I have already had an insurance quote for, with no special flood insurance required, and it came up as high risk. When I checked the MLS, the property is not in a flood plain zone. That site appears to me to be more commercial in order to solicit insurance prospects. Maybe some others have had good luck with it, but it doesn't appear to be 100% reliable to me. @Leigh Ann Smith I deal with land in the Phoenix, AZ area and the Maricopa county online tools are very helpful as they show both the flood plains (which can be built on but needs to be "built up") and the flood zones (cannot be built on). I'm not sure what tools are available through your county but if you call their office, they should be able to tell you. Your title company should be able to provide flood plain/zone information as well. An ALTA survey is typically another tool that reveals flood plains/zones. Hope this helps. Great link, @Ariel Cohen ! Okay, here's an example from that map. Will flood insurance be required for this house? Great link, @Ariel Cohen! Okay, here's an example from that map. Will flood insurance be required for this house? It looks like the house is in zone X which does not require flood insurance IME. Since the structure does not touch the higher risk zone you should be in the clear. If you want to be sure of the accuracy of a flood map and the location of a particular house you might try having a structural engineer look up the location for you they always seem to have access to the most accurate information as they have to design any building to be structurally sound on any location or tell you if its not feasible and just move on to another property.